One never knows what’s going to turn up in the barn on Friday, when it’s time to pack the CSA shares. 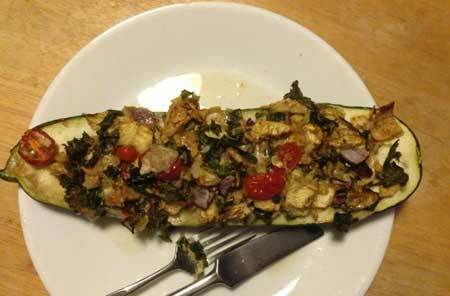 Last week, it was zucchini and other squash from Worden Farm. Most were average sized, some maybe a bit on the small side. But, there were a few that Chris Worden slipped in to the order that were a bit larger — “as big as a baseball bat,” he warned Farmer Margie Pikarsky. 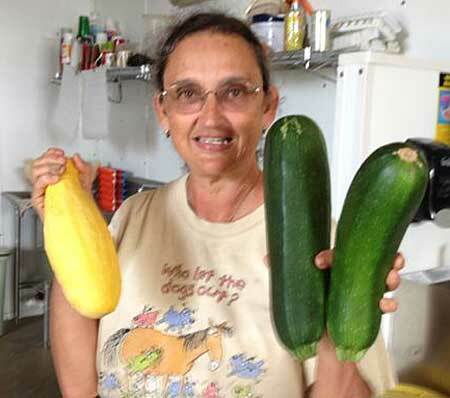 Farmer Margie with giant squash. But Margie begged to differ. “This is a bowling pin,” she told me, holding up a yellow squash. 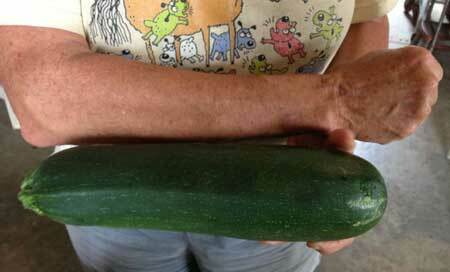 “And these are clubs,” she added, holding up two giant green summer squash. They certainly looked like they had heft, and could hurt somebody’s noggin. Zucchini the size of her arm. “It’s the size of your arm,” I pointed out. We put the vegetable side by side with Margie’s forearm, which normally appears sturdy and strong. But next to the giant green club, her forearm looked thin and frail. Now that is a monster of a vegetable! But it didn’t stand a chance against the hungry farmer. Out came a big kitchen knife the size of a machete and whack hack smack the clubs were split in half. Their innards were carved out with a spoon to make boats, no, dugout canoes one could use to traverse the Everglades. Those insides were tossed into a bowl along with heirloom tomatoes, scallions, pepper jack cheese, crumbled organic corn chips, a few seasonings, and maybe a few other scraps that were lying around. 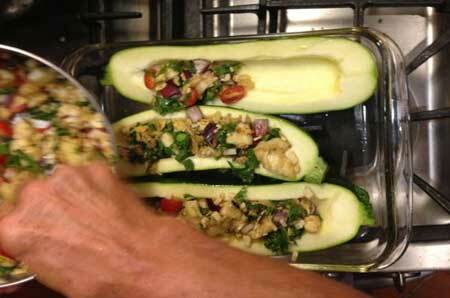 The stuffed zucchini baked in the oven at 350 for about 30 minutes. Out came these delicious marvels, one per person. And that was all you needed to fill you up for dinner. Yum! Bet you can’t eat the whole thing! 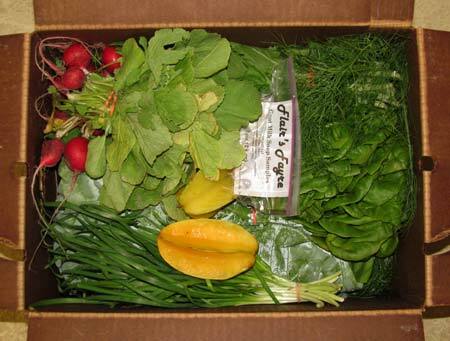 Last Friday, the CSA share boxes were stuffed to capacity, both the family and small sizes. As soon as I opened the flaps of the family share box, I saw its contents were packed solid, with each vegetable fitted carefully in its place, just like a puzzle. I knew I was going to have a problem remembering where everything went, after I was done arranging and photographing. So I pulled out my smartphone and snapped pictures as I started to unload the contents. They were my map — and now I share them with you in the form of two short animations. Dive in! What do I do with the fennel? 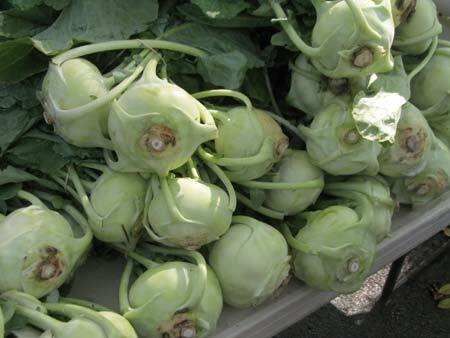 The start of the CSA season couldn’t come soon enough! This summer, even though I tried to shop for local produce at nearby farmers markets, it was all too easy to backslide, and to gradually eat less and less fresh food (other than mangoes, avocados, and salads). Don’t get me wrong, I love vegetables. But there’s something about opening up a packed-full box of produce and just diving in. This Friday, as I set up to take photographs of the shares, I felt that familiar thrill as I opened the first boxes of the season. Oooh, what’s in here? Star fruit, yum! Followed closely by, what am I going to do with fennel? Will I even like it? No matter, I’ll try anything once. 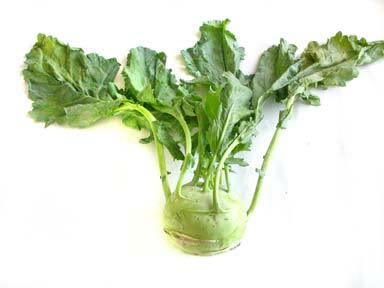 And there’s a recipe for caramelized fennel in the CSA newsletter. But still, what do I do with the tops?? If anything, belonging to the CSA has introduced me to new things that I never saw or tasted before. If they weren’t in the box, I would never have tried them or known about them. 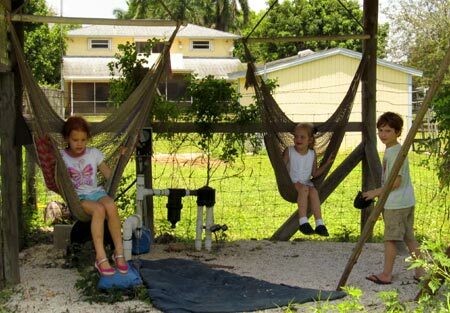 I remember feeling really adventurous eating black sapote and canistel, and took to saying, “You won’t find that in a grocery store!” Belonging to a CSA delightfully stretched me out of my comfort zone of eating. Photographing the shares is a great privilege. I get to see in advance what’s in the box, and share it with you on this blog and in the farm newsletter. It amazes me every week how farmer Margie and her crew manage to cram all that goodness into one box. Easy enough to dismantle it all, but don’t ask me to repack it the same way! Opening the first box of the season. Arranging different items for the photograph can be tricky. 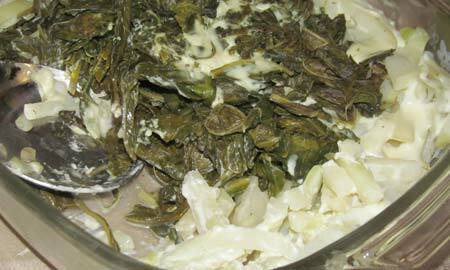 This week the challenge was — what do I do with the fennel? Its fluffy fronds take up so much space. Does it go in the front? Off to one side? In the back? There’s a lot of tweaking things, and stepping back to peer through the viewfinder. Once it looks right, click click click! What you see is what you’ll get, no faking. The most I’ll do is use some hidden props to hold things in place. No matter what’s in the box, the recurring challenge is, how do I place each item so you can clearly see what it is. The picture has to be distinct in black and white for the printed newsletter, too. Once a farm volunteer asked me, “Do the veggies speak to you?” Always the smart aleck, I shot back, “Yeah, they say eat me!” She looked disappointed. Truth is, they do speak in a gentle whisper, beseeching like any divalicious model, “Make me look good. I want people to love me.” And I do want them to look attractive, vibrant and three dimensional. It’s my weekly zen practice, as it were. And then I get to cook and eat my subjects. Fun! Dinner’s ready! While packing shares last Friday, farm hand Victor spotted this beauty. 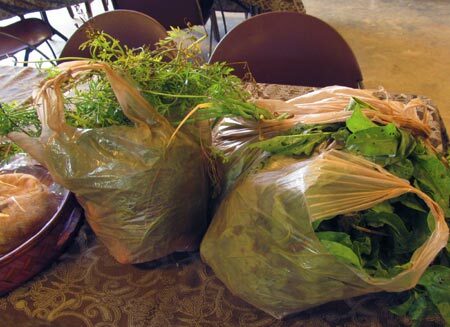 CSA members, did you look carefully at the fronds of fennel that was in your share box last week? You might have been lucky enough to get a caterpillar! 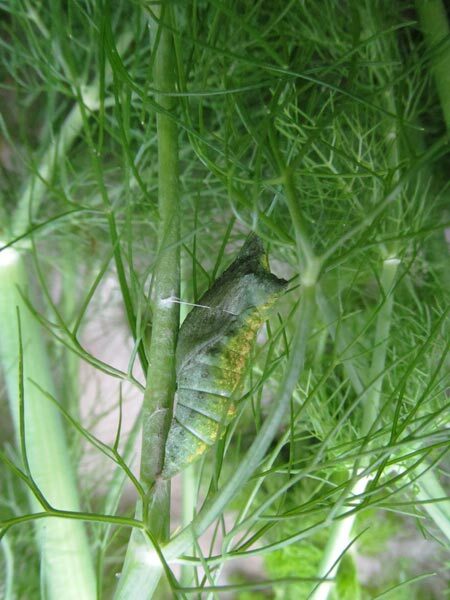 Look carefully, there’s a thin line holding it in place on the branch of fennel. The caterpillar is starting its transformation into a chrysalis, and from there, will emerge as a butterfly. Anybody got any ideas what what kind of butterfly this might become? Potluck lunch in the barn. 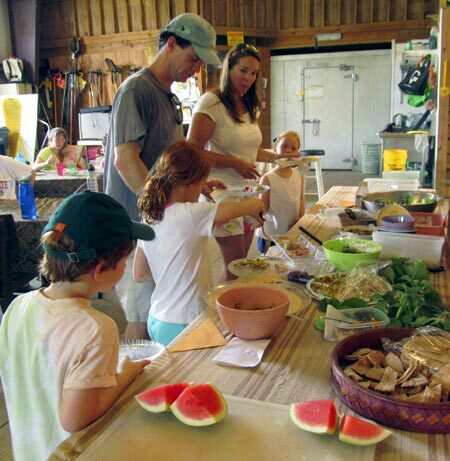 CSA members gathered at Bee Heaven Farm recently for Gleaning Day. They brought potluck dishes to share, and bags and containers for their loot. 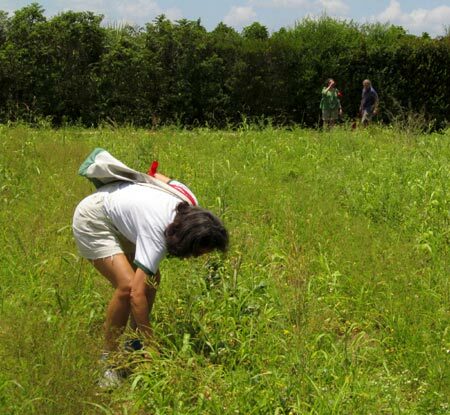 Because on Gleaning Day, you’re allowed to forage for your veggies. 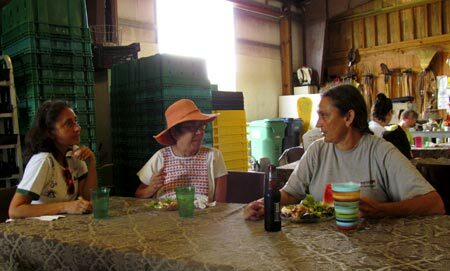 Lisa and Alex chat with Farmer Margie. Digging for treasure among the weeds. The challenge is to find what’s left. To the uninitiated, frondy carrot tops look like the weeds that surround them. But with a little effort, the orange treasures release their grip on the soil jump into your bag. Hanging out in the pump house. 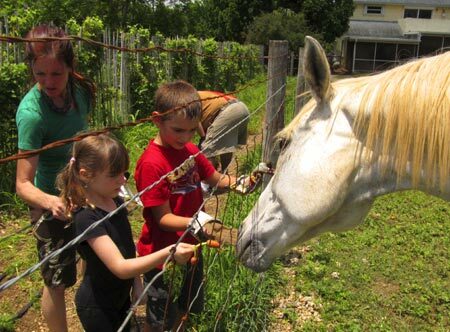 Bali the horse loves Gleaning Day, because people want to feel him carrots. Bali looooves carrots! 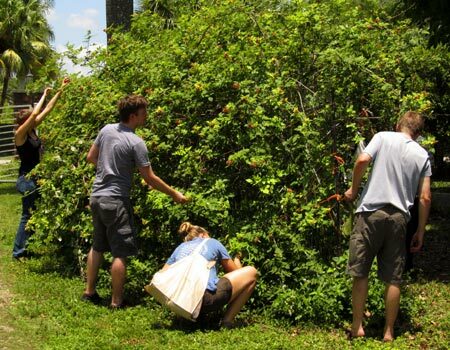 Gleaners braved scratchy thorns in the raspberry brambles and had a berry berry good day. Bags of veggie loot (mostly carrots — berries went straight into the mouth). Napping in the shade of the java plum tree.